Eye exams are important for everybody; young or old, healthy or with a complicated medical history, we all need to make comprehensive eye exams part of our health and wellness routine. The benefits of a regular eye exam extend far beyond determining your vision today. Your annual eye exam presents a built-in opportunity to discuss any eye health issues with your primary eye care provider. Although patients don’t have to wait for that yearly appointment to consult with the eye doctor about eye allergies, dry eye, computer vision syndrome, or to discuss the possibility of LASIK or Latisse, many patients find this routine visit to be a springboard to greater eye health. Why do you really need an eye exam? While your optometrist will discuss general eye health, examine your eyesight and give a prescription for corrective lenses if necessary, perhaps the most significant benefit of visiting your eye doctor on a regular basis is to rule out eye diseases and treat developing eye conditions early. Serious ocular diseases, such as glaucoma, macular degeneration and diabetic retinopathy, often progress without symptoms during the early stages. Treatments that begin during this pre-symptomatic phase are generally associated with a better prognosis, as preventing vision loss is usually more successful than restoring lost eyesight. The risks for developing age related eye diseases including the ones mentioned previously as well as cataracts and presbyopia, increase with age, so the need for frequent eye exams becomes more pressing. Taking care of your eyes throughout your lifetime, including undergoing an eye exam on a regular basis, is recommended for good vision and eye health. 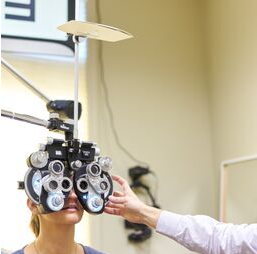 Combining advanced technology and keen diagnostic capabilities, you can have confidence in the eye doctors at Westlake Texas State Optical’s comprehensive eye exam in Austin Texas. A complete eye exam is made up of several eye tests, which may vary in complexity from the simple Snellen (Big E) eye chart to the sophisticated digital retinal imaging. Please note, throughout all the tests, you never need to worry about giving “the wrong answer” or saying the wrong thing – we’re not testing you; we’re testing your vision. Additionally, your eye exam may include a medical history, as it relates to eye health, since the eyes contain several tissue types and many other systems play a role in eye wellness. To find out if your eyes will be dilated, and whether you can expect to be able to drive safely after the eye exam, please speak with our staff in advance. Eye exam appointments typically take an hour, but can be shorter or longer, depending on various factors. When Should I Schedule My Eye Exam? or call Westlake TSO today (512) 327-3605 to book your eye exam. Dr. Kamnetz and his staff are the best! I've been going there for many years (too many to count!) and have always received the best customer service and care. I highly recommend this office. The entire staff is absolutely amazing, I have a consistently great experience every time. Everyone goes out of their way to make sure I am happy. They have a large selection of glasses and I always leave happy with the price I paid. This last time my glasses were ready on the SAME DAY! Every single time I have coming in I have been probably seen. The staff is always courteous and helpful and no matter which Dr. *ICE I always get great care. Everyone I encountered there was extremely nice and professional and helped me understand all the tests and results in detail. I really appreciated the detailed review of the Digital Eye Exam by Dr. Kamnetz. It was very thorough and informative. Very communicative! They gave me very comprehensive information throughout my appointment. What a great experience! Dr. Gregg Kamnetz has a wonderful personality & I look forward to my eye exams. His experience and knowledge give me great confidence in trusting my eyesight to him.